the original tribe of Ayvondil survivors tried to rebuild their homeland . Apparently there was a particular reason why the king orin made Ayvondil as their first target . Moon priestess, the wisest woman who led the dark elf had a forbidden relationship with the King orin. King Orin was living with fear knowing that The moon priestess was pregnant . King orin then called forest wizard to kill The Moon priestess. But Forest wizard was late , the baby girl had been born. And when The Forest wizard found the baby girl, he couldnt against his own compassion for the baby. What he did was so opposite, he kidnapped that baby and brought her to a safe place . King orin impatiently waiting to hear the news from forest wizard which never came. So he brought his legion troops to come to ayvondil and destroyed all that exists there. Innestaasia, name given by the forest wizard to the daughter of priestess of the moon , grew up under the care of forest wizard. She was not only inherited her father ‘s nature who is bold and cruel but also inherited the magic power as owned by The moon of priestess . There was moon power united with dark power within her soul. Now she had grown up and heard that dark elf tribe led by his mother were trying to rebuild their homeland. And she wanted to he came back to her homeland. Knowing that their princess came back, the dark elf tribe greeted her happily because they had the figure of the queen again , who would lead them and kept their homeland . However, being silent was not the nature of Innestaasia . She had managed to build forces in The Eternal forest , one of the region in Ayvondil , and prepared to revenge to King orin. And to the firstborn who did nothing when dark elf was being attacked by King orin. Not only that, Innestaasia who was full of hartred  of her past , now  she intended to turn the world into what she wanted. And she promised to kill all the strangers who come to her homeland. 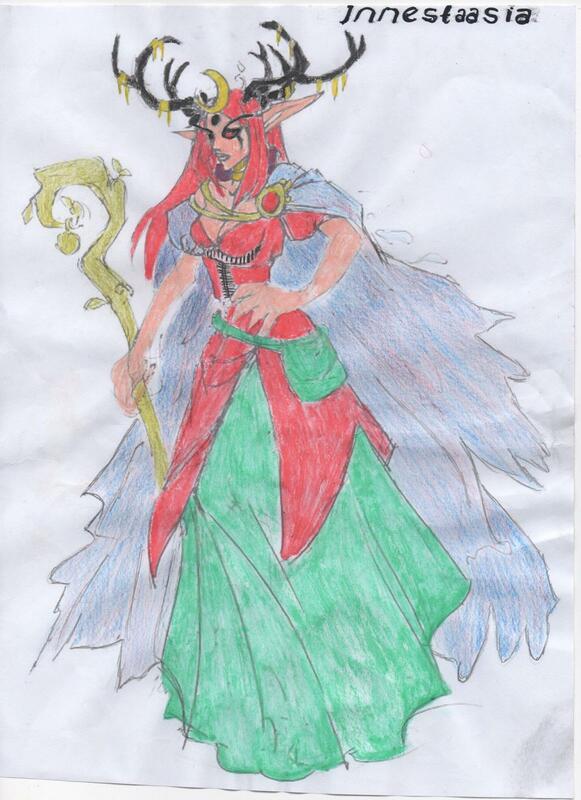 Storm : Innestaasia uses her staff to call thunder and use it to attack them which has 3 yard radius. This skill also has paralyzed effect which makes rogue cant use stealth and exclusie jump, bd cant use sprint and shiked, barb cant use charge and heal, pala cant use aura and heal, ranger cant use blessing and scattershot, necro cant use shield and heal, warlock cant use stone body, priest cant use shiled and heal, mage cant use teleport. Just dk, shaman and druid who will safe from this skill. Hurricane : it summons  tornado which will attack them who are in 5 yard range. Moonrise : using the moon artefact which is on her horn. The light which comes out from the horns will make them who aare in 3 yard range will move without  directions for 3 seconds. Cyclone armor : using the wind as her shield. This skill will make the attackers receive counter attck for 50% from their normal hit. Atk type : Magic Skills. Wew, good luck y sis! Bgus! tpi hp ny 700rb aja ?